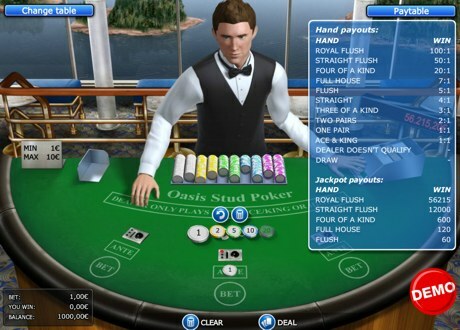 Oasis Stud Poker Premium is exciting game with international rules that suits both beginners and advanced players. You can choose your croupier, bet levels and the playing location. It costs just one euro to play for the jackpot starting at €37,500. Oasis Stud Poker is played with a 52-card deck without jokers. The objective is to beat the poker hand of the Dealer. The Player makes an initial bet in the box marked ’Ante’. The Player receives 5 cards face up and the Dealer 4 cards dealt face down and 1 card face up. b) PLAY the hand and place an additional bet equal to double the value of the initial bet in the box marked ‘BET’. The Dealer shows his/her 4 remaining face-down cards. For the player to be able to win or tie on both ‘Ante’ and ‘Bet’ the Dealer must qualify to play, e.g. hold an Ace and a King or better. If the Dealer does not qualify, the Player wins 1:1 on the ‘Ante’, and the ‘Bet’ wager will be returned. If the Dealer qualifies to play and the Player’s poker hand beats that of the Dealer, the Player wins 1:1 on the ‘Ante’ wager, and the ‘Bet’ wager is won as shown in the paytable. If the Dealer qualifies to play and his hand beats the Player’s hand, both ‘Ante’ and ‘Bet’ wagers are lost. If the Player’s hand and the Dealer’s hand are of equal value, it is a draw, and the bets are returned to the Player. How to Play Oasis Stud Poker Premium? Choose one of the 5 tables and the dealer and background that you prefer by clicking on them. There are 5 different table limits from €1 to €10 to €10 to €100. To play for the jackpot, click above the ‘Ante’ box to place a 1 euro chip in the coin slot and you will get a chance to win the jackpot. Then press DEAL to start the game and the cards will be dealt. You can choose to play your cards or to fold. If you choose to play your cards click BET. This costs twice the initial bet. The Dealer then shows his/her cards. If you wish to fold, you give up the ‘Ante’ bet and the game is over. As Caribbean Stud is a game based around poker hands, it's important to familiarise yourself with the hands and their rankings on the payout table.